There’s not a small business owner anywhere who can’t relate to uncomfortable feelings associated with the financial uncertainty of his business. Even the most successful smaller companies walk a tightrope at times and with close to 2.8 small businesses in the U.S., that’s a lot of tightropes. Balancing profits against expenses, trying to predict an already fickle economy and of course, trying to stay a step ahead of his market to ensure he’s always fresh and relevant with his offerings is enough to cause even if the most confident business owner a night or two of lost sleep and even question his business decisions. It doesn’t have to be that way, though. After all, you went into business for yourself to improve yours and your family’s life. And let’s face it, securing a loan through resources such as your bank or the Small Business Administration can take months; often, that’s simply not feasible for a small business that’s entering its busiest season or needs to expand to meet a few new clients’ needs. These are just a few reasons why the Small Business Micro Loan Visa Card works so well. 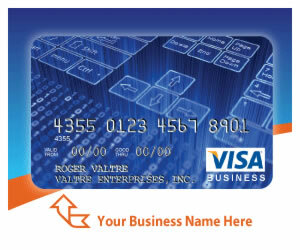 This Visa card has specific dynamics in place that will serve your small business needs well. The ceiling is $750, so it’s not a big financial obligation that can overwhelm your financial portfolio. It’s perfect for covering those smaller needs small businesses incur on a daily basis. Not only that, but the credit requirements are a bit more lax than traditional offers small businesses might consider. Sole proprietors and entrepreneurs are welcome to apply, too. Your small business will enjoy the buying power a credit card with your business name offers. While this is considered a great offer, there are the details that small business owners must also consider. First, the APR is 23.99% and there is an account origination fee as well as monthly maintenance fees. The origination fee is a one time charge of $125. The monthly maintenance fee is $9.95, which equates to $119.40 a year. For those small businesses that have an international angle, your foreign currency transaction fees, when incurred, are 3%. Additional cards for employees are $30 each and if your payment is returned, you will incur a $35 fee. The account origination fee and your first monthly maintenance fee is charged to your account when you activate the credit card. That totals $134.95 and of course shows as a difference between your credit limit and available credit. While these fees and charges may seem a bit high, it’s important to contrast them against the many benefits, especially if your business isn’t eligible for traditional financial products. As we mentioned, the new credit card is issued in your business name, so it serves your business presence well. You’ll enjoy online account access twenty four hours a day, seven days a week. There aren’t the usual “red tape” scenarios. Applying is easy, too. Provide your name, your business and other identifying information, along with your tax id number and business banking information, and usually, this is all the information required. Approval is quick, too. Running a small business has its challenges and anytime a product becomes available that helps business owners, it’s sure to spark interest. It’s an ideal way to keep the piece of mind that comes with knowing you have options as a business owner. Suddenly, the company car that needs repairs or a copier that’s long since served its purpose and should be replaced isn’t the overwhelming expense it once was. It’s that bit of capital that can mean the difference in success or failure, especially in a tough economy. Your goal is to ensure the success of your small business, after all, it has your heart and soul in it, right? This small business credit card is the solution for many business owners. Only you can decide if it’s the right fit your particular business structure and needs. Once you’ve weighed the benefits with the costs associated, you’ll be better able to make that decision.